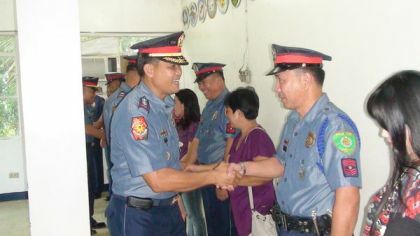 MAASIN CITY, Southern Leyte, Jan 20 (PIA) –- Residents from Southern Leyte would be glad to know that the crime rate in 2011 was an improvement from that of 2010, as reported by the Philippine National Police-Southern Leyte Provincial Office through provincial director P/SSupt Allan Cuevillas. Cuevillas reported that the crime volume, based on reports submitted from the different municipal police stations throughout the province decreased in 2011 with 929 as compared with the 2010 figure of 1,285. The index crimes were reported at 734 and 501 and the non-index crimes at 551 and 428 for the year 2010 and 2011, respectively. Index crimes refer to murder, robbery, homicide, theft, physical injury, to name a few, and the non-index crimes refer to the special laws such as illegal logging, illegal fishing, illegal gambling, illegal drugs, among others. Cuevillas, who was assigned last October 2011 to the post also presented in a slide show the comparative crimes against person, against property and the crimes committed in 2010 and 2011, showing the municipalities with the highest and the lowest crime rates. Meanwhile, in order to effectively respond to any incident and to improve the day-to-day activities of the police force, Cuevillas requested the assistance of the provincial government through the PPOC chaired by Gov. Damian G. Mercado for a one team Special Weapons and Tactics (SWAT) training. “This is a preparation for any incident not only within the city of Maasin but the trained team can also respond to other municipalities in case of emergency,” Cuevillas said.